The Real ‘Bombshell’: France and Germany Unite! German Chancellor Angela Merkel (right) and French President Emmanuel Macron sign the Aachen Treaty on January 22 in Aachen, Germany. American journalists love to report “bombshells.” Bombshell news about a celebrity. Bombshell news about a “miracle cure.” Bombshell news about President Donald Trump. But there was a much bigger bombshell on January 22, and most journalists didn’t even notice that it had gone off! The biggest bombshell of January was the Aachen Treaty. In some of the most important aspects of national power, France is bolting itself to Germany. And people think that other EU nations should do the same. This is a real bombshell! Europe’s second-most powerful nation is giving its power over to Europe’s most powerful nation, and this might be just the beginning. The treaty also contains a mutual defense clause. If either France or Germany is attacked, the other nation will come to its defense. The nato alliance, which includes the United States, already provides these two nations with guaranteed defense in case of attack. So why are they making an independent agreement about it? The treaty indicates that these two countries are already looking past nato. If America pulls out of nato or the agreement otherwise falls apart, Europe will have to protect itself without American firepower. France loves Germany! How true that is. Deutsche Welle wrote, “Never before in French history has there been a government so fixated on partnership with Germany.” France plans to lobby for Germany to receive a permanent seat on the United Nations Security Council, which is where the real power of the UN lies. The five permanent members of the Security Council are the five victors of World War ii—the U.S., United Kingdom, France, Russia and China. Now France wants Germany, the instigator of World War ii (and World War i), on board. How soon we forget our history! My father wrote in the February Trumpet: “France really does love Germany—you can see it in these important joint ventures!” That was written before this treaty was reported. France and Germany are already the two strongest powers in the EU. If they hammer out their differences beforehand and join forces in every debate with other EU nations, they will dominate the rest of the bloc even more than they already do. The smaller, weaker EU states with dissenting opinions, especially those who are in debt to Germany, will face pressure to support things like a “real European army” or face consequences, perhaps as extreme as getting kicked out of the European bloc altogether. “The text bears the imprint of Mr. Macron’s desire to use Franco-German consensus to rally the EU into becoming more assertive as a global power” (ibid). In reality, there will be no “rallying” about it—the Franco-German consensus will impose its will on the other members! “There are concerns that the ever closer union between the bloc’s two most powerful economies could create a juggernaut capable of crushing dissent beneath its wheels. “The Aachen Treaty lays the groundwork for a Franco-German defense and security council that would act as a ‘political steering group.’ … Berlin and Paris will also frequently exchange diplomats and civil servants. Ministers from one country will regularly sit in on the other’s cabinet meetings. On the military front, the treaty enshrines an ambition to form a ‘common culture and common deployments’ overseas” (ibid). This is real integration! This is real European Union. This is a 21st-century empire! This news story should be alarming to students of history. In the early 1900s, people felt the world was too modern and sophisticated for something like World War i to ever happen. In the 1930s, people thought the world was too modern and too sophisticated for something like World War ii. Now again, people are feeling too modern and too sophisticated to worry about something like World War iii. This should be a real bombshell to students of Bible prophecy. It is part of the fulfillment of a modern resurrection of the Holy Roman Empire. Revelation 17:12 states that this revived empire will consist of 10 kings, meaning 10 nations or groups of nations. It will be unified through the direction of the Catholic Church, and Daniel 8 states that at the very top will be a strong German leader. France is giving much of its power to Germany. Soon other Catholic-influenced nations will as well. Aachen was not chosen as the venue by chance. The city … was the capital of the Franconian King Charlemagne, sometimes called the “father of Europe,” whose empire stretched over large parts of what later became the European Union’s six founding countries, including France and Germany. The treaty was signed in the coronation room of the historic Aachen town hall. The tourist website for the hall says, “The town hall represents the theme of power.” The hall was originally part of Charlemagne’s palace complex, and it is filled with frescoes and images of the Holy Roman emperor, including a large portrait and a life-size bronze statue of him holding a sword in one hand and an orb in the other. The hall also houses copies of Charlemagne’s crown and other regalia from his coronation. The replicas were commissioned by Kaiser Wilhelm ii—the leader of Germany before and during World War i.
Germany and France are getting serious about European unification. They want political action, they want to be sitting together on the UN Security Council, and they want a European army—a real one. Can you begin to see how this alliance will be pared down to 10 nations? Eight other nations or groups of nations will also lend their power to Germany. But others will leave or be pushed out. Europe will have its core of nations that, like Charlemagne, are serious about political power, serious about economic power, serious about religious power, and serious about firepower. Could it be any more obvious? Europe is uniting before our eyes! The Times story coincides remarkably well with the feature article in the February Trumpet, which is hitting mailboxes right now. My father wrote about how France is turning away from its traditional allies, Britain and America, and toward its traditional enemy, Germany—the nation that has repeatedly invaded it, most recently in 1940 during World War ii, a conflict that crushed and degraded France and killed a total of 60 million people. France’s attitude toward the U.S. and Britain today is often open rebuke. That will soon turn into open betrayal. France descends from Reuben, one of Joseph’s brothers who betrayed him into slavery. (Read The United States and Britain in Prophecy for a detailed explanation of the modern-day descendants of the 12 tribes of Israel.) Britain and America descended from Ephraim and Manasseh, the sons of Joseph. In this end time, Reuben will betray his brother again (Genesis 37), as my father has explained on the Key of David program. But the Bible also tells us this coming strong leader will not be French! … This strongman will command the army Macron is helping to build right now! But it will be a German that takes it to war. This leader will not be French! 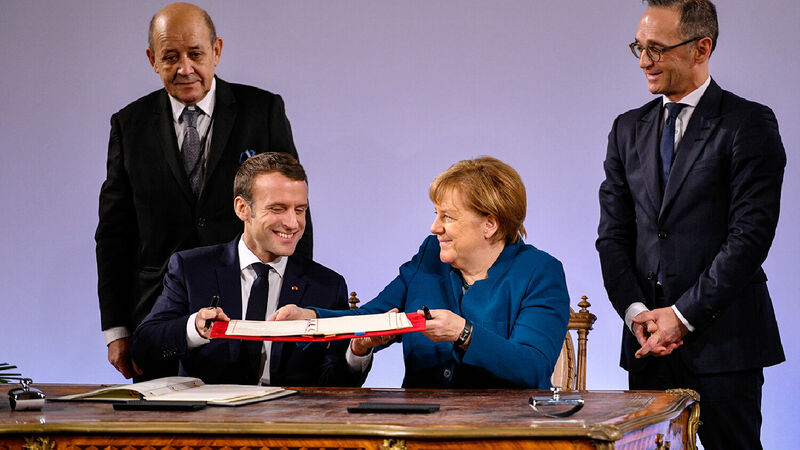 Macron might be willing to sign this treaty with Merkel right now because he sees that Merkel is weak and hopes he can take advantage of that. But although Germany’s leadership is currently weak, that is about to change! A strong German leader will soon come on the scene, and Europe will unite quickly under his leadership. Gradually, and now faster and faster, a new power is being developed from underneath the surface. A new world power which the public now least suspects, which the world does not yet see, doesn’t realize, doesn’t dream is coming, but it is developing just as prophesied in Europe. A resurrected Roman Empire. … A power so mighty that our Western peoples will stand aghast when it flashes suddenly into full being. Yes, your Bible says that the world will be startled. Keep an eye on this partnership between France and Germany. Prophecy is being fulfilled at an astonishing rate, and we must follow Christ’s admonition in Matthew 26:41 to watch and pray. The world will be startled when this empire suddenly appears—but we don’t have to be.